This week, I waited anxiously every day to get something in the mail. I'm expecting about half a dozen things, but only got one! Not to downplay the one thing I got because I was super excited. It's just that I'm not used to getting mail, and in the last couple of months, I've actually started winning things (a first!) and I've been getting mail - very exciting for someone who works all the time and has little else to excite her lol. So, the one super cool thing I got in the mail this week was 3 signed bookmarks and a postcard from Kiki Hamilton, author of The Faerie Ring, which comes out September 27th. Anyone who's visited my blog regularly knows I'm slightly obsessed with all things faerie, so I'm really looking forward to this book. Anyway, Kiki had a blurb on her blog saying that if anyone wanted a bookmark and postcard to email her, so I did, and my little package of awesomeness arrived Thursday. I'll be keeping one of the bookmarks, giving one to my local indie bookstore, and giving one away in a future giveaway, so stay tuned for that! 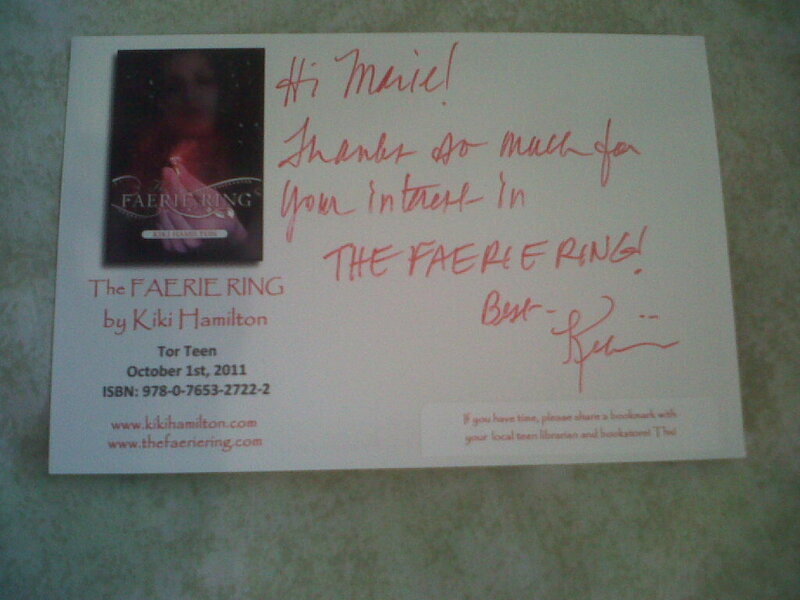 Be sure to check out Kiki's blog, and you can read the synopsis of The Faerie Ring on GoodReads, or pre-order your copy from Amazon! Thanks so much for sending this, Kiki! I'm super excited to read this one; I've had the pleasure of getting to know Patricia a bit through Facebook, Twitter and our blogs, and this book sounds really good! One day a week or two ago, I got a notification from Twitter saying that 'Claire Cook' was following me. I thought...no way, the name's a coincidence...but when I clicked the link, it was the Claire Cook, author of the book Must Love Dogs, which was turned into a movie with the oh-so-yummy John Cusack. And as if that wasn't enough, Claire 'liked' my Facebook writer page! I almost died! I've had her books on my TBR list forever, and my mum has read and loved some of her books, so after the whole Twitter/FB thing, I bumped her books to the top of my list and decided to start with Seven Year Switch because it was one my mum recommended. Speaking of books I've had on my TBR list forever, this is another one. When I went to the library this week, I didn't intend to get anything other than Seven Year Switch, which I had on hold, but I saw this one and grabbed it. That's what I got in my mailbox this week. What did you get? Nice haul! 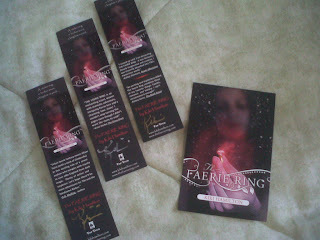 :) I'm jealous of that Faerie Ring swag! It looks so cool. I really want to read the Jessica Darling books but I've not got round to them yet! Nice week! I am quite obssessed with all things Faery as well, so I'm looking forwards to that one. Also, Being human sounds great! heard great things about sloppy firsts. i'm going to try read it soon. awesome IMM this week--enjoy and happy reading! i hope you can stop by our IMM this week. Faerie Rings looks fantastic. Have a good week and happy reading.